Photo by Chip Harlan via Creative Commons/Flickr. El Centro de la Raza is selling locally-grown Christmas trees and wreaths again this year, supplied by a local family-owned business. Proceeds from the sale will help support El Centro’s programs. You can pre-order a tree before November 23 to receive a discount, and then pick out your tree from the El Centro tree lot between November 25 and December 21. Prices for trees range from $21-$80 until November 23, and $25-$85 from November 25-December 21. Wreaths are $18-$28 during the discount period, and $20-$30 afterward. The order form is here. For more information, call 206-957-4605 or email execasst@elcentrodelaraza.org. Caspar Babypants (Chris Ballew) will perform at the Wellspring Family Services open house on Saturday. ‘Tis the season for sharing good cheer! Here are some ideas to get into the spirit of giving. Get a great deal on a Christmas tree at El Centro de la Raza and support the many programs they offer our community. Don’t miss the Wellspring Family Services open house on Saturday, December 4, at 1900 Rainier Avenue South. 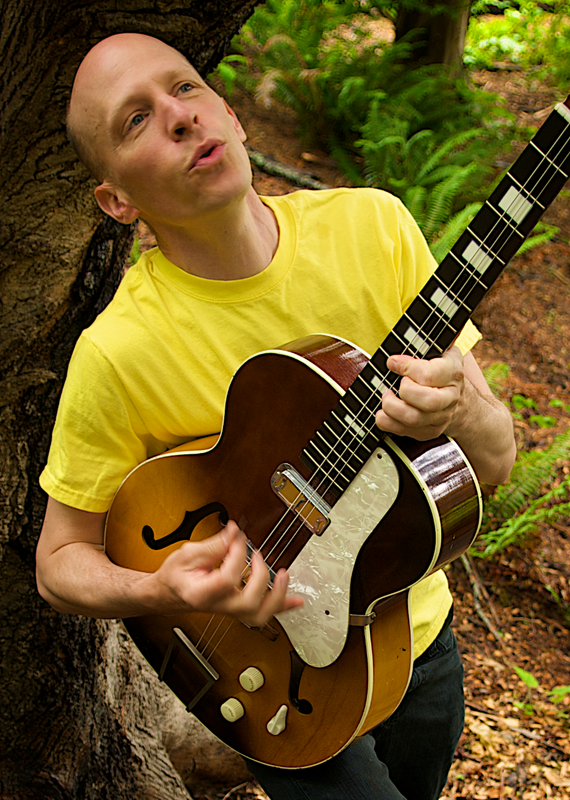 The event features a free performance by Caspar Babypants (aka Chris Ballew of the Presidents of The United States of America) and other musicians. The open house is free and for all ages, but please bring a new unwrapped toy to support the holiday drive. You can donate your child’s outgrown clothes and gear (car seats, high chairs, etc.) now and all year-round. Why not start a new tradition and ask your child to make room in the toy box for new things? Clean your pantry and/or pick up extra items for a Beacon Hill food bank. South Beacon Hill neighbors can donate to Beacon Avenue Food Bank, located at 6230 Beacon Avenue South. North Beacon folks can donate to El Centro’s food bank. Mid-Beacon neighbors can flip a coin—or donate to both! The Alleycat Acres urban farming collective relies on donations and volunteers to keep their community-run farming efforts going. The silent auction is sold out, but you should still make a donation to Open Arms Perinatal Services, a nonprofit agency helping pregnant women. Do you know a nonprofit we missed? 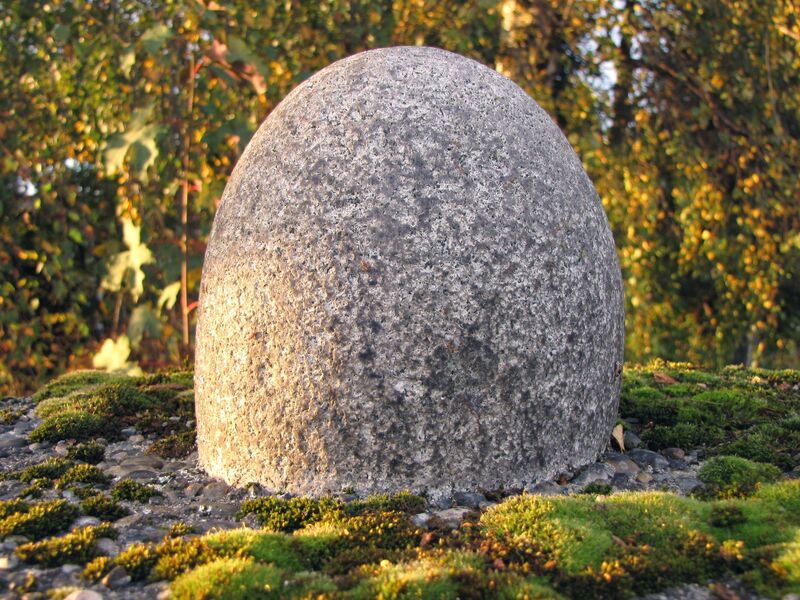 Can you identify this landmark? If so, you should enter our contest. Photo by Wendi. You can still win a NAMSAYIN #36 bus t-shirt and a $50 gift card to The Station coffee shop (and, folks, that’s a lot of potential caffeine!) if you’re the first person to identify the 16 locations pictured in our contest post from earlier this week. Better work fast, though — we already have some guessers who are very close to getting all of them. The Seattle Department of Transportation wants to know “what you think about transit in Seattle and how it could be better.” You can tell them by taking their survey. It’s fairly short. And speaking of SDOT, The SDOT Blog has some pictures of the newly spiffed-up South Columbian Way. Andrew Matson of The Seattle Times features rapper Nacho Picasso of Beacon Hill’s Cloud Nice hip-hop collective. There is a sound clip and a link to download even more. The Cloud Nice page also has a link to a Nice Dreams trailer with some Beacon Hill-area footage. You might have noticed sheep baa-ing somewhere on Beacon Hill lately. Dylan Ahearn mentioned it the other day, but here’s a reminder: Tomorrow (Saturday) is the Walk & Bike Beacon Hill Neighborhood Transportation Summit. It’s a neighborhood meeting to discuss ways to improve safety and mobility while walking and biking on Beacon Hill. The event is from 10:00 am to noon at Beacon Hill International School, 2025 14th Avenue South. Activities will include designing safe walking and biking routes, learning about bike safety for children, and more. Refreshments will be served. All ages are welcome. For more information, please contact Frederica Merrell, frmerrel@seattleschools.org. If you’re already thinking ahead to Christmas, you might want to get your Christmas tree right here in the neighborhood. 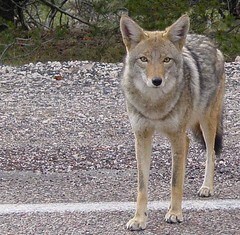 No, don’t chop one down in the Cheasty Greenbelt, please. Instead, you can get one from El Centro de la Raza. Trees will be available at their lot Wednesday through Sunday, starting November 26 and running through December 19. Order before the 26th and there will be a discount. There will be 2′-7′ Grand and Noble Firs, live trees, and 20″ and 30″ wreaths. Purchases will support El Centro’s many programs. El Centro is located at 2524 16th Avenue South. 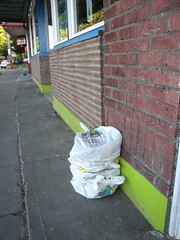 These unwanted phone books, wrapped in plastic bags, sit forlornly on the sidewalk in front of Yoga on Beacon. Photo by Wendi. Beacon Hill neighbor Willie Weir has some thoughts about the waste of space and resources that old-style paper phone books have become for many of us. Read his article “26 Seconds” on his blog, Yellow Tent Adventures. We know it’s summer… finally! But we need your valuable input on a potential winter fundraising idea! Do you buy a Christmas tree during the holiday season? If so, would you be interested in buying one from El Centro de la Raza, meaning your purchase would directly support El Centro’s 30 important programs? We’re considering selling Christmas trees this year, but we want to know if our community thinks it would be a good idea. The folks at El Centro have posted a survey for community members to give their opinions on the Christmas tree question. Follow this link to fill it out. Thrillist has a video visit to Tasha’s Bistro Café along with a brief blurb about Tasha and the restaurant. Three Brothers Cleaners will close soon. Photo by Wendi. 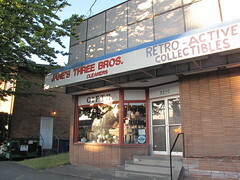 We hear that Three Brothers Cleaners, located at 3210 Beacon Avenue South, will be closing at the end of this month, and the gift shop located in the same space will close too. If you have any clothes that need to be picked up, or any gift shopping that needs to be done, better get in there soon. Rebuilding Together Seattle (RTS), a nonprofit organization, is currently accepting applications from homeowners in need. RTS provides free home repair services for low-income homeowners through the support of sponsors and community volunteers. To qualify for the program, homeowners must be low-income and unable to complete the work independently. RTS also assists non-profit or community organizations in need of facility repairs. For more information or to apply, see the website. The event is limited to 50 people and there is only one space left, so hurry! And check out the photos from last year’s photowalk here. This is just a quick reminder that the Piñata Party is this Saturday, July 17 from 12 noon – 3:00 pm. Hope you can make it—because you are the party!! It’s in its usual location in the center of Triangle Park (Stevens Place Park — Ed.) across from the Beacon Library on Beacon Avenue. This year we’re doing it potluck style so pack a blanket and if the spirit moves you—maybe something to share. But, no worries if you just wander over with your fabulous selves. We’ll have piñatas, snow cones, fun drinks, snacks, a Lion Dance, traditional Oaxacan music and a performance by our much loved Lushy. We’re excited. Hope to see you Saturday and bring your neighbors!